Sports Medicine, both as a science and a philosophy of medical care, has made incredible strides over the past 45 years. Somewhat an offshoot of the running boom of the 1970’s, the idea that you could accelerate an athlete’s safe return to sport, has produced some of the most prolific research in medicine regarding orthopedic injuries. As Sport therapists, we routinely draw from the literature regarding such wide-ranging topics as predictive return to sports testing, optimal muscle load production, proper arm slot for maintaining shoulder mechanics in the throwing athlete, and the vital importance of core stability for extremity function. 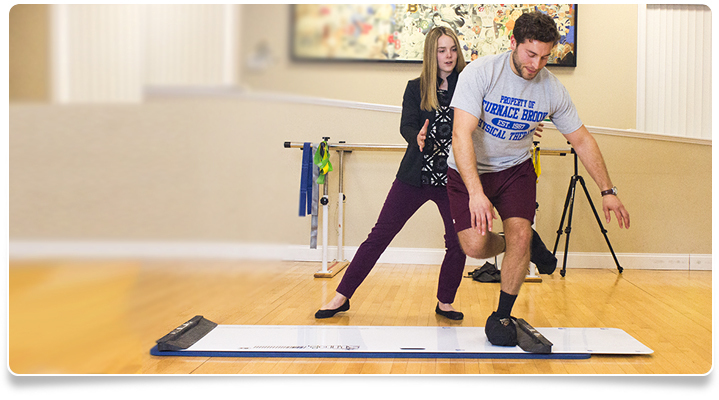 The Staff Therapists at Furnace Brook Physical Therapy pride themselves in applying these scientific principles daily to every athlete that comes for treatment. This ranges from the young female Irish step dancer with heel pain, to the high school soccer player with a history of concussions, to the recreational skier who has just torn their ACL and underwent a reconstruction, to the recreational softball player who has underwent a rotator cuff repair, and many, many more. The integration of scientific principles in rehabilitating athletes is paramount to their personal success. Further, these principles must be safely used with respect to the athlete’s age, competitive status, gender differences, and personal goals. Among these treatment principles may simply be structured rest with time in the pool, timed immobilization, various types of loading for strength and tensile purposes, kinesiotaping, various types of stretching, core stability training, and functional training. However, it doesn’t stop there. Furnace Brook Physical Therapy has the facility space to also simulate sports specific activities. Golfers need to swing; soccer players need to kick, basketball players need to rebound and hockey players need to shoot. We also have a wealth of contacts if sports performance doesn’t stop with the discharge from physical therapy. Whether it be a referral to yoga, a Sports Medicine physician specialist, Cross-Fit, the Micheli Center for Sports Injury Prevention, or the Dan Boothby Sports Training Center, we know what to do. Call us today for an appointment at 617-770-4167. We serve Quincy, Massachusetts and surrounding areas. Furnace Brook Physical Therapy is proud to announce a partnership with the Sports Medicine Department at Eastern Nazarene College (ENC) in Quincy. 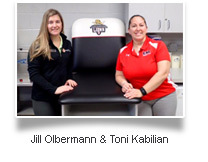 Starting with the new sports season in August 2016, Furnace Brook PT Staff Therapist Jillian Olbermann has treated ENC student- athletes at their training facility on campus. With a primary goal of providing improved access and successful return to sport for the injured athlete, Jill works closely with Head Athletic Trainer Toni Kabilian, AT and under the direction of team physician, Eric Berkson, MD. “It’s been great working with these student-athletes in their environment. It gives me a better understanding of their training and practice regimens so I can adapt their treatment plans in order to get them back on the field/court quicker”, relates Jill. Toni Kabilian, AT adds,” Furnace Brook PT has rehabbed our athletes for over ten years at their facility in Quincy. Bringing the sports therapists of Furnace Brook onsite now accelerates the athlete’s first appointment for therapy, while working within our team concept here in the training room. The athlete has less of a reason to miss a visit, and I get the feedback I need to make return to sport decisions in a more timely manner. We still have access to Furnace Brook’s pool and other equipment at their main office, but bringing them here provides for a more cohesive approach to sports medicine at ENC.” GO LIONS!